Trading at Kuwait Stock Exchange closed Tuesday with rises recorded in each of its three indices, the price up by 15.7 points, the weighted 3.16 points, and KSX 15 13.7 points. 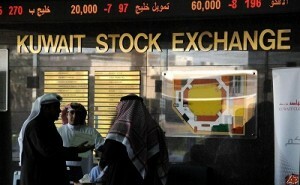 The number of transactions came to 3,483 worth around KD 19.6 million with 147 million shares changing hands. The top gainers were (AJWAN), (PEARL), (FIRSTDUBAI), (KOUTFOOD), and (KCIN), while the most traded stocks were (INVESTORS), (ALSALAM), (BAYANINV), (ALDEERA) and (GFH).